As part of my decade living on Africa's West Coast, our family spent a memorable year in the Republic of Gabon, which hugs the Atlantic, straddles the equator and is roughly the size of France. Being health fanatics and outdoor types, my mother Suzanne, brother Jean Pierre and I thrived in the hot, humid climate - and in 12 months, managed to visit much of the countryside. This gave us an intimate connection with the Gabonaise culture and was valuable in my future career in tourism. We enjoyed a laid back, tropical lifestyle; food was delicious and varied, the shops and stalls were full of interesting items and tempting snacks. What's more, to our delight, the traditional West African culture had in no way disappeared with the oil boom. Thanks to mineral wealth and a relatively low population growth, Gabon is better off financially than most of Africa. This fact is reflected in their care and attention to basic ecological concerns. For example, the vast coastal wetlands and marshes, are still largely intact. This is something with which ATA members will heartily agree, the Association being a strong advocate of ecotourism. 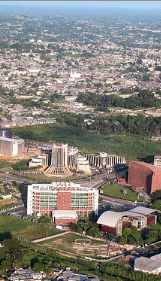 Gabon, which hosted the Africa Travel Association (ATA) International Congress in 1980, is easily accessible from the USA and Canada. 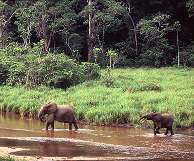 Gabon's Great Leap: With a stable government and 11 percent of the country's land area set aside for the parks, Gabon is uniquely positioned to become the ecotourism capital of Africa. Photographer Nicolas Reynard trekked through Gabon's new national park system, where lush forests hide Africa's largest concentration of undisturbed-and camera - shy - animals. Could these parks change the face of ecotourism and preservation in the Congo Basin? When French photographer Nicolas Reynard and writer Tom Clynes set out to test drive three of Gabon's 13 new national parks for "The Gabon Experiment, they expected dozens of close encounters with the forest's denizens of hippos, elephants, gorillas, and mandrills. Excerpt from National Geographic. West Africa's Freedom City: Libreville, our home at the time, began as a settlement for freed slaves on the site of a naval fortress. How did it get its name? In 1849, our French ancestors captured a slave ship, releasing all of the passengers at the mouth of the Komo River. In joyous response and gratitude, the newly freed slaves named their settlement Libreville (Free Town). A lively and charming capital, Libreville reminds me of a quieter, more laid back 50s version of Miami Beach, with its large ocean-view hotels. To name a few, there's the Hotel Mont-Bouet, the Ebene, Rendema Meridien, Novotel's Rapontchombo, Hotel Okoume Palace Inter-Continental, Hotel Mont de Crystal and Hotel Gamba. Libreville's chalk white buildings contrast dramatically with the dappled green shades of the nearby equatorial forest. It's a city of modern office buildings, fancy shops, supermarkets and white, sandy beaches inside city limits. Not far away (140 km) on the south coast is Port -Gentil on Ile de Mandji, a coastal island to the south. Fueled by oil funds and relatively high wages, the town has dozens of restaurants, night clubs and unique shops. 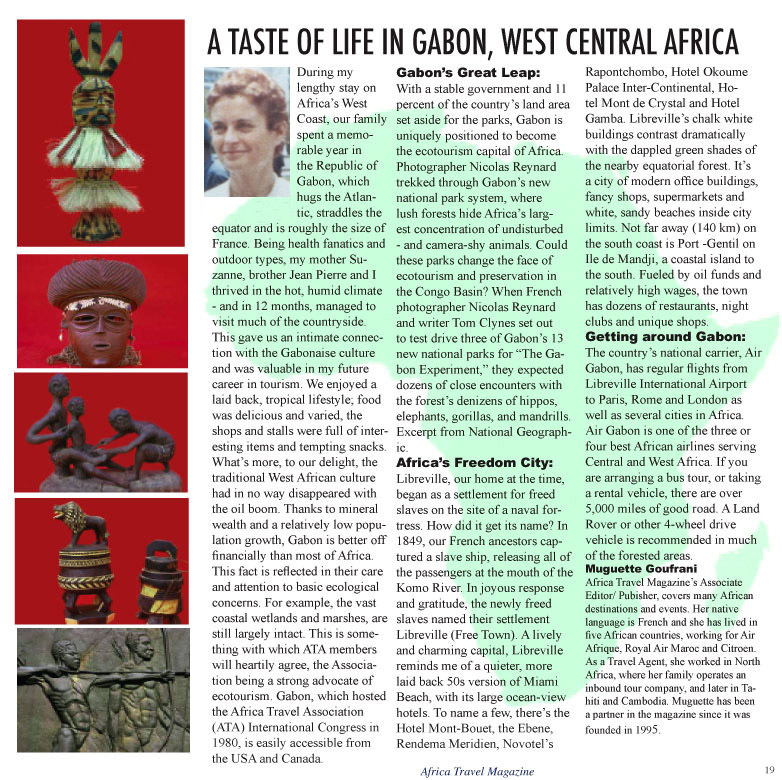 Muguette Goufrani, Africa Travel Magazine's Associate Editor/ Pubisher, covers West African destinations and events. Her native language is French and she has lived in five African countries, working for Air Afrique, Royal Air Maroc and Citroen. As a Travel Agent, she worked in North Africa, where her family operated an inbound tour company, and later in Tahiti and Cambodia. Muguette has been a partner in the magazine since it was founded in 1995.